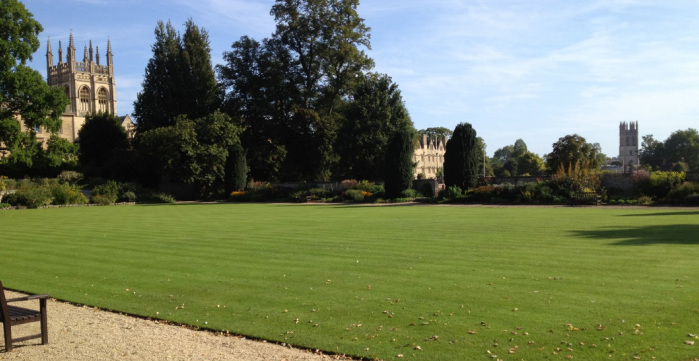 Oxford is super easy to get to from the airport or London. We chose a bus trip straight from the airport. It took about 90 minutes.The bus was plush and comfortable and we nodded pleasantly off after being up all night on the plane. The driver figured out exactly where we needed to get off, and kindly made sure we didn't miss the stop. A true gentleman, he was. Of course, Oxford is a college town. It just happens to be eons old and steeped in cool history and architecture and pubs and shopping and tea shops and little lanes and passageways. Which takes it up to the level of sublime. Super sublime. Oxford actually has its own color: "Oxford Blue"
We watched the guy paint this door and asked him how he got it so shiny. He explained his process, which has way more steps than we use when we paint our doors. The key, it seems, is to lightly sand the paint between coats. And to add a tad of mineral spirits to the paint. And to use oil-based paint. None of which we do. Which probably explains why my front door looks nowhere near as awesome as this one. 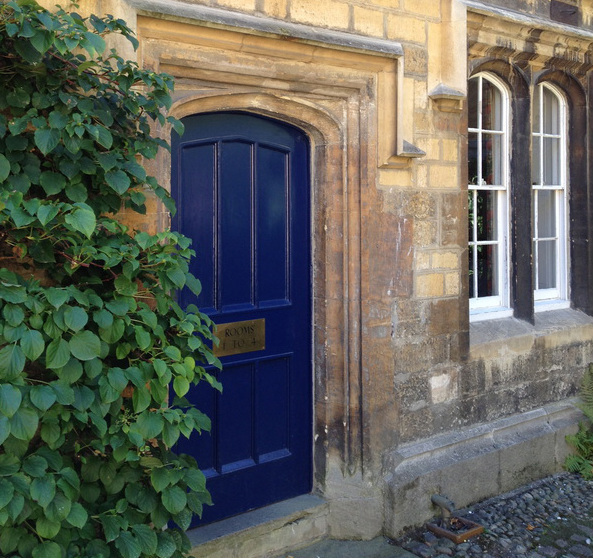 The same shade of blue is used all over Oxford. Here it is on bulletin boards in a dorm room at University College, and on a university dorm door. Judging by the number of pubs, there's quite a bit of drinking going on in Oxford. We were happy to join in. Here are a few of our favorites. It's a bit eery walking around Oxford under the disapproving eyes of these haughty creatures. What the heck is a "grotesque" anyway? I had to look it up. It means a decorative work that combines incongruous human and animal figures with scrolls, leaves, etc. OK. Now we know. You might care to know that the word gargoyle comes from our friends the French—from the wordgargouille, which means throat. Why might you care to know this? Because then you'll understand what these guys do (the gargoyles, not the French). They have a purpose. Gargoyles channel water from the stonework or gutter of a building and spew it out through through their mouth (like gargling). Neat, huh?